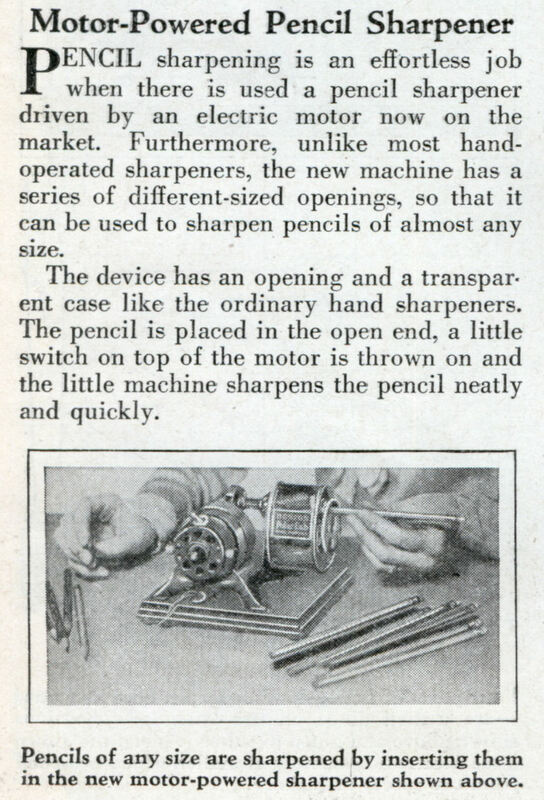 PENCIL sharpening is an effortless job when there is used a pencil sharpener driven by an electric motor now on the market. Furthermore, unlike most hand-operated sharpeners, the new machine has a series of different-sized openings, so that it can be used to sharpen pencils of almost any size. The device has an opening and a transparent case like the ordinary hand sharpeners. 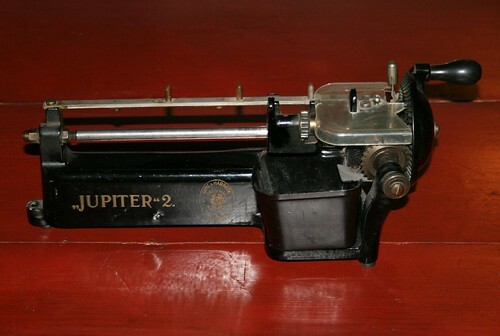 The pencil is placed in the open end, a little switch on top of the motor is thrown on and the little machine sharpens the pencil neatly and quickly. Now they just need to add switches to turn on and off the motor automatically when the pencil is inserted. Hey, have you seen the older pencil sharpeners, that looks a like a lathe? First time I’ve seen that. However with a name like that, it’s probably lost in space. I noticed that the electric cord on the sharpener in the picture has been airbrushed out except for a couple of rickety-looking wire ends going into the motor. If the rest of that cord looked like those ends, it’s no wonder that they brushed it out. As for the lathe sharpener, at least that one looks like a neat piece of workmanship. I wish I had one of those sitting on my desk. Rick, it’s a little had to tell from the picture, but I suspect that’s rayon-covered twisted electrical cord, common on electrical stuff from the ’30s. I have used the modern version of it for restoring antique electrical stuff, and it works perfectly fine. See http://www.sundialwire…. . . . . Yes Don. I have seen that kind of cord on old electrical stuff (antique lamps, etc.) 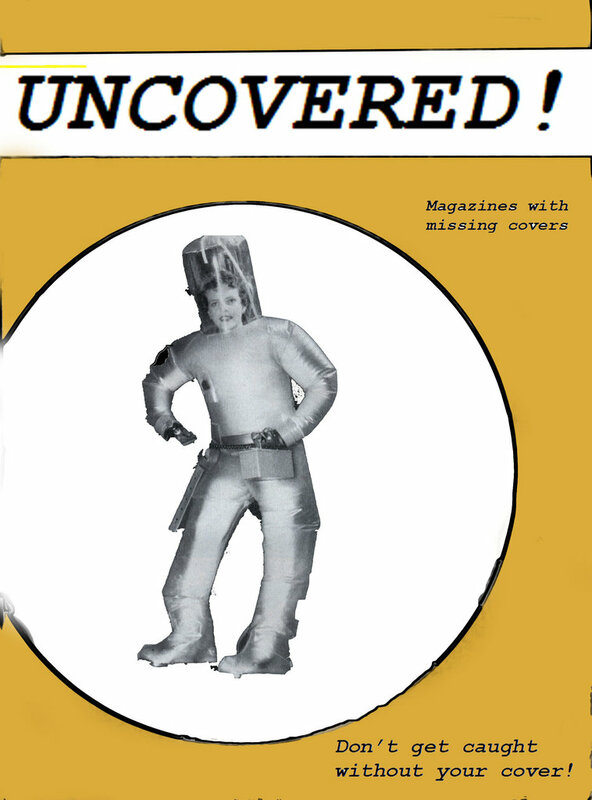 but didn’t know what the covering material was. Still, the looks of those old cords don’t inspire much confidence 😉 Thanks for the info.